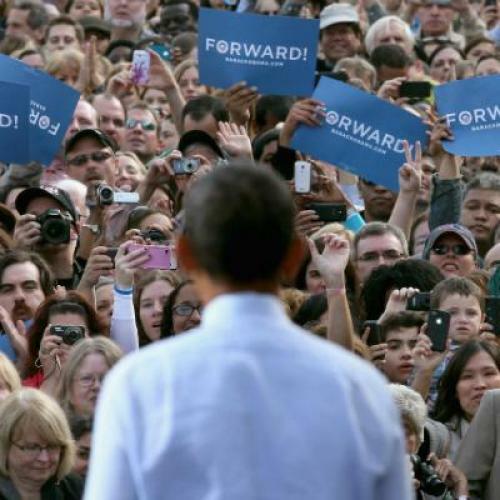 If President Obama is reelected, his second term will be shaped by the terms of that victory, and by the circumstances he will face the morning after. In all probability, Obama’s winning margin would be the lowest for the incumbent since 1916—maybe ever. Worse, there is a non-negligible chance that he could win a split decision—a narrow victory in the Electoral College, a narrow defeat in the popular vote. Whatever may have been the case when the Constitution was drafted, majority rule is the core of legitimacy in contemporary political culture. Unless the next few days yield a strong surge toward Obama, he will enter his second term holding a relatively weak hand. The nature of the 2012 campaign poses an additional difficulty. I cannot remember an election in which the gap was greater between the magnitude of our problems and the substance of our politics. With rare exceptions, Mitt Romney has alternated vacuity and self-contradiction, with interludes of fuzzy math. At the same time, Obama decided not to place a clear, ambitious agenda at the heart of his reelection campaign, focusing instead on a relentless effort to portray Mitt Romney as an unacceptable alternative. Even after the first debate, which blew up that effort beyond repair, the president continued to resist pressure from within his own party to put a more explicit second-term plan on the table. His interview with the Des Moines Register, which he tried to keep off the record, revealed more about his intentions that anything he had said on the stump. A fiscal “grand bargain” and comprehensive immigration reform—two key items in that interview--cannot succeed without public support. You can’t get public support for proposals you don’t push—hard—during the campaign, as George W. Bush found out in the spring and summer of 2005. I have no doubt that Obama’s aspiration to do big things is as burning as ever. He believes that we need sustained public investments in areas such as education and training, basic and applied research, infrastructure and energy if we are to place the U.S. economy on a sound foundation in a globalized and increasingly competitive world. (For the record, I agree with him.) My point is rather than the way he has chosen to conduct his campaign will make it even harder than it had to be to get these things done during his second term. That matters because Obama is all but certain to preside over a government that remains divided. While the Democrats may narrowly maintain control of the Senate, everyone with the possible exception of Nancy Pelosi expects the House to remain where it now is—in Republican hands. So as has been the case since November of 2010, the president’s post-election choices reduce to two—compromise or gridlock. As it has been for some time, the key to picking the lock is fiscal policy. The most urgent challenge—starting the day after the election—is the fiscal cliff, which unaccountably went undiscussed through three presidential debates. Its components include, not only sequestration and the Bush tax cuts, but also the alternative minimum tax, Medicare payments to doctors, and much else. Between Nov. 7 and the end of December, a reelected President Obama would have to decide whether he is willing to go over the cliff, as some Democrats have urged. The downside is macroeconomic: a CBO analysis suggests that the post-cliff combination of tax increases and spending cuts would be enough to push the fragile economy back into recession—not the ideal way for Obama to begin his second term. If the president is not willing to accept these foreseeable consequences of inaction, he must decide what he’s willing to accept to prevent them. Easy compromises split the difference. Hard compromises contain elements that each party to the agreement regards as bad public policy. Given the polarization between the parties, getting to yes anytime in the next few years will require a series of hard compromises. The alternative to compromise is a continuation of confidence-sapping drift and slow national decline. My fear is that this election campaign has done nothing—if anything, less than nothing—to prepare the parties and the American people for the choices that lie ahead. Obama isn’t solely to blame for this, of course, but the way he chose to run for reelection has made a bad situation worse.